I don't know about you guys, but when I was 14, I was going through couch cushions trying to find enough change to buy a $7 Papa John's pizza. So $2,000 was basically an impossible figure. FORTUNATELY, there is an eating contest. And yes, the grand prize is $5,000. So David is in it to win it, but also is spending time hanging out with his friends, helping take care of his autistic brother, and dealing with his middle child feelings. It is an A+ middle grade book. It's funny, it's emotional, it strikes right at the heart of things, and it gives you a glimpse into the world of competitive eating, which...man. 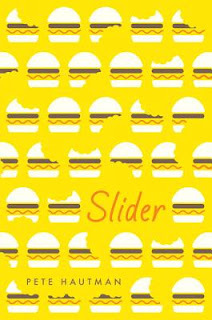 Slider is out in hardcover September 12th from Candlewick Press. Git it for yourself or some 10 year old you know. Aww, okay, I will try it. I do not read a ton of middle-grade fiction, so I completely depend on you to tell me which ones to read. Well this sounds adorable and that first gif WELL DONE.